At last spring’s Philadelphia Science Festival I talked about early 17th-century thoughts about extraterrestrial life. Here is a draft of that talk. The news recently has been filled with stories about Kepler 186f. In case you missed it, Kepler 186f is an earth-sized planet orbiting near the outer limits of the habitable zone of a dull little star about 500 light years away. Its discovery has prompted speculation and celebration that astronomers have finally found earth’s twin, or maybe earth’s cousin, or perhaps earth 2.0. Twitter exploded—to the extent that it Twitter ever “explodes” about scientific discoveries—with optimism about this untrammeled world as if it’s some postlapsarian paradise, or at least in the minds of many Twitters a pre-capitalist paradise. While news articles and tweets typically overstate the similarities between Kepler 186f and the earth, even astronomers get caught up in the excitement, describing their great progress finding habitable planets and their hopes of finding planets that show some form of alien life. This is not the first time that people, astronomers and otherwise, have looked to the heavens in the hopes of finding habitable planets. Nor is it the first time people have imagined traveling to those planets and finding a paradise inhabited by beautiful human-like creatures. If we turn back the hands of time 300 years, we can watch as astronomers, natural philosophers, and authors wondered about the inhabitants of our nearest neighbor, the moon. In the early 17th-century there was a flurry of scientific and popular speculation about habitable planets and extraterrestrial life. Philosophers, astronomers, theologians, lapsed Catholics and Protestants all chimed in. Certainly part of the motivation for contemplating other worlds was prompted by growing familiarity with the new astronomy. Following Copernicus and his heliocentric system, people wondered about the size of the universe. The comfortable, finite universe was expanding and seemed likely to lose its limits entirely. If the universe was infinite, how many of those little dots, those stars, were really suns like ours? And how many of those suns were home to planets like ours? And how many of those planets supported life, perhaps like us? These were real questions with real consequences for people in the late–16th and early–17th centuries. Giordano Bruno is probably the most (in)famous person to think about the size of the universe and the number of other habitable planets. But in many ways his wild speculations were vague flights of fancy grounded in nothing but his own imagination. Much more interesting, I think, are the more restrained arguments of people like Johannes Kepler, the German astronomer/astrologer who is best remembered for his three laws of planetary motion, or John Wilkins, an English clergyman and member of the Royal Society, or Francis Godwin, an Anglican Bishop. They turned not to distant stars in their early-modern search for extraterrestrial life, but to the planet they knew best, the moon. Join me as I glance first at Kepler’s dystopian lunar world and then at Godwin’s lunar utopia. The conclusion is quite clear. Our moon exists for us on the earth, not the other globes. Those four little moons exist for Jupiter, not for us. Each planet in turn, together with its occupants, is served by its own satellites. From this line of reasoning we deduce with the highest degree of probability that Jupiter is inhabited. Jupiter is fine and all, but Kepler became really excited when he read Galileo’s description of the surface of the moon. The moon, with its mountains and valleys, turned out to be a lot like the earth. The large dark and light areas must, it seemed reasonable, be land masses and seas, just as on earth. Kepler agreed with Galileo that the dark areas were oceans while the light areas were continents. Kepler was sure an atmosphere of air and clouds encased the moon — he claimed that his teacher had even observed rainstorms on the moon. If the moon was like the earth with mountains, valleys, an atmosphere, and water, it must also support life. Indeed, when Kepler looked closely at the drawings of the moon in Galileo’s book, he thought he detected evidence of intelligent inhabitants. Caves. He saw evidence that the moon’s massive inhabitants, for Kepler was certain they would be much larger than humans, had dug out enormous caves to live in. Beyond evidence of their handiwork and his brief comment about their size, Kepler refrained from describing the lunar inhabitants. He was sure, however, that advances such as the telescope would soon reveal them to us. Kepler never stopped thinking that the moon was inhabited. Over 30 year he collected his ideas together in a book published just after he died, his Dream . Here Kepler mused more concretely about the moon’s inhabitants and the conditions on the moon. He considered the length of the day and the night—each 14 time longer than our day or night. How and when lunar people slept. He also worried about how the lunar creatures survived the unbearably hot lunar day. And how they kept warm during the long, freezing lunar night. While their caves provided some shelter from the sun, he thought he had good evidence for thick layer of clouds that covered the moon and offered some relief from the sun during the lunar day. To help them survive the lunar night, Kepler pointed out that the light reflected from the earth would provide some warmth. When Kepler turned to life on the moon, he realized it would have to be very different from life on earth—the lunar climate was too harsh to support creatures just like humans. He imagined a sort of antediluvian nightmare world populated by giant winged, reptilian and amphibian creatures that lived short, harsh, nomadic lives. But why was Kepler so interested in who or what lived on the moon? Well, then someone may say, if there are globes in the heaven similar to our earth, do we vie with them over who occupies a better portion of the universe? For if their globes are nobler, we are not the noblest of rational creatures. Then how can all things be for man’s sake? How can we be the masters of God’s handiwork? If other planets are inhabited, do humans live on them? If humans live on those planets, did God create them and did each world have its own Adam and Eve, and Original Sin? Had Christ died for their sins? And if so, did Christ die once, on earth, for all the universe’s inhabitants, or was he some sort of planet-hopping savior, dying an infinite number of deaths on an infinite number of planets? In short, were we alone and unique in the universe or were we just part of some cosmic hoi polloi? Astronomers like Kepler weren’t the only people to ponder such questions. Popular writers too worried about these issues in numerous books and pamphlets in early 17th century. Francis Godwin, an Anglican bishop, wrote one of the most widely read texts on lunar society. 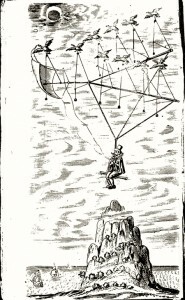 Godwin’s Man in the Moone appeared in 1638 and was an instant success. His book recounted the picaresque adventures of a young nobleman, Domingo Gonzales. Somewhere in his adventures, Domingo discovered a flock of amazing geese that when properly harnessed could transport him through the air. These geese saved him from harm a couple of times before one day, as they carried him to safety once again, his geese migrated to the moon. After twelve days they arrived at the moon. Godwin wasn’t alone in thinking there might be geese strong enough to carry a human—there were credible reports of giant birds carrying animals as big as elephants and Francis Bacon, that hero of experimental science, considered the possibility of harnessing birds for flight. That’s right, geese migrated to the moon where they wintered before returning in each spring. Domingo Gonzales on his way to the moon. When Domingo arrived on the moon, he found it inhabited by incredibly tall, peaceful, beautiful people. Their complexion was perfect, and they were an indescribably beautiful “lunar color.” They spoke a lilting, sing-song language. Domingo spent nearly two years amongst the lunar people before returning to earth. Godwin’s Man in the Moone was not just a fanciful novel. He, like Kepler, based his description of the moon in the best contemporary knowledge. But unlike Kepler, Godwin envisioned a lunar paradise. On his journey to the moon, Domingo had been able to observe the daily rotation of the earth. This observation, he claimed, convinced him that Copernicus was right, at least about the diurnal motion of the earth—Domingo remained unconvinced that the sun was at the center of the universe. Also during his trip to the moon, Domingo noticed that as they traveled farther from the earth the force attracting the geese and him to the earth weakened. He concluded that there was some secret, innate force in planets that attracted things to them, perhaps like the force that attracted iron to magnets. Because the moon was roughly one third the size of the earth, the force of holding things to the moon was considerably weaker. Consequently, plants and animals were many times larger than on earth. An advantage of this weak attractive force, Domingo explained, was how lunar people traveled. They leapt into the air and flapped large feathers to guide their slow descent. In this way they could travel many miles in a single bound. The lunar society was a utopia: The atmosphere itself was fertile and supported not only the inhabitants but also nourished vegetation, which never needed to be cultivated. Lunar people naturally despised all vice and ever committed any crime. There were no physicians because wounds healed naturally, even a severed head would reattach if placed by on the body in a timely manner. Perhaps most amazing (at least to any of us who have experience with kids these days), all children were wonderful and well behaved—Domingo did point out that the lunar people could tell a bad child at birth and would send these bad children down to “a certaine high hill in the North of America.” Finally, these lunar people seem to be Christians of some sort. To be sure, Godwin’s Man in the Moone is an imaginative and optimistic description of lunar society—sort of a 17th-century Pandora filled with early-modern Na’vi. His Man in the Moone , like Kepler’s Dream and more recently James Cameron’s Avatar , uses extraterrestrial life to examine contemporary issues and to try to understand our place in the cosmos. In the 1630s they could only look as far as the moon for those aliens. Today, with our more powerful telescopes and CGI techniques, we can look 500 light years or more into the universe.